As I was doing a search on Google today, I noticed something new. 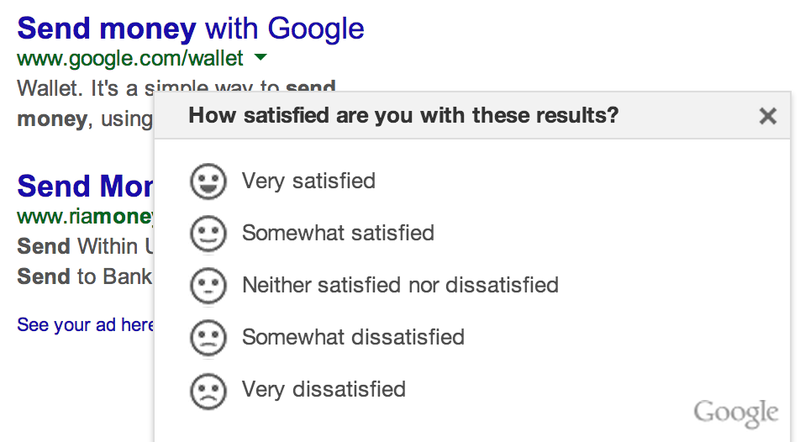 A user response poll appeared at the bottom right side of the SERP, asking me for my satisfaction level with the search results. This is interesting, since we know that Google uses a variety of metrics to evaluate search quality, such as bounce rate and CTR. Now, they’re asking for our subjective opinion in addition to the objective metrics. After I clicked the “Very satisfied” option, I got a standard Thank You message and the poll box disappeared after a couple seconds.